It was a sad day for Malaysians and the whole world when it was announced on Monday night that Malaysian Airlines flight MH370 which had been missing for more than two weeks had crashed into the Indian Ocean leaving no survivors. This conclusion was based not on hard evidence - in fact, the plane or its wreckage had not been found so far - but on analysis of satellite data by a British company and an aviation investigation agency. Obviously, this had provoked much frustration and skepticism. I feel so sorry for the families and relatives of the passengers and crew on board this fateful flight. After waiting for more than two weeks hoping against hope for some good news, this was what they got. It was heart breaking. With no physical evidence of the plane, it would be hard for those affected to find real closure. To the Chinese (two thirds of the passengers were Chinese citizens), the possibility of not finding the bodies would be unthinkable as their burial and funeral traditions would be disrupted. Anyway, I would like to dedicate a song in memory of the passengers and crew of flight MH370. Although I have named the song "In Memory Of MH370", this does not mean that I have stopped hoping for a miracle as I do not think we can assume "beyond reasonable doubt" that the plane had crashed into the Indian Ocean and that there were no survivors - although I must admit chances of them surviving were getting slimmer with each passing day. This song is also dedicated to all those who are working hard to locate the plane. May the plane be found soon and the black box retrieved so that there will be closure to this horrible incident and so that one of the world's most puzzling aviation mysteries is solved at last. Note : This work and recording is copyrighted. All rights reserved. 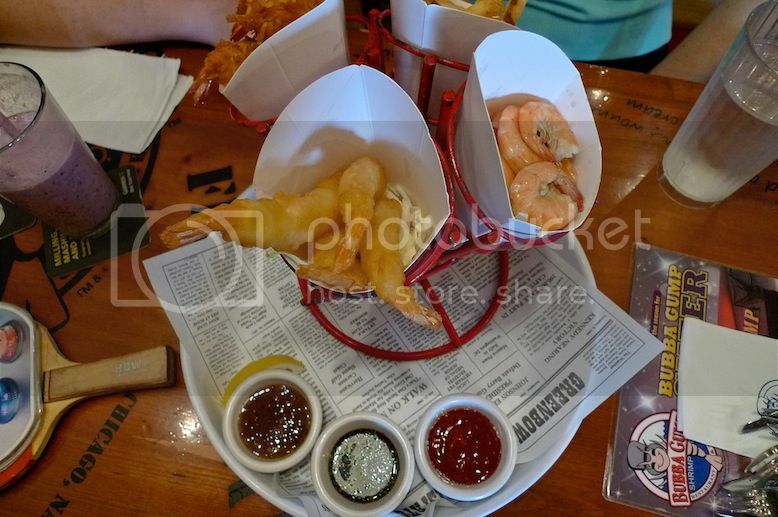 My Lunch At Bubba Gump Shrimp Co. 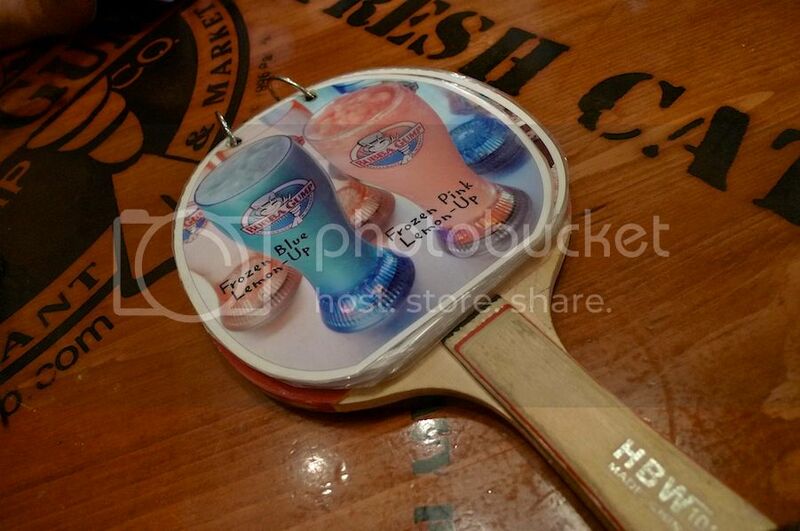 I am currently so behind in my blog posts that I cannot even remember when I ate at Bubba Gump Shrimp Co. at Sunway Pyramid! I suspect it must have been a week or two after Chinese New Year - how long ago was that? About 6 weeks ago? Anyway, this is only my second time dining at Bubba Gump. First time was at The Curve in Petaling Jaya, I think. This round, I went with my sister and nephew. 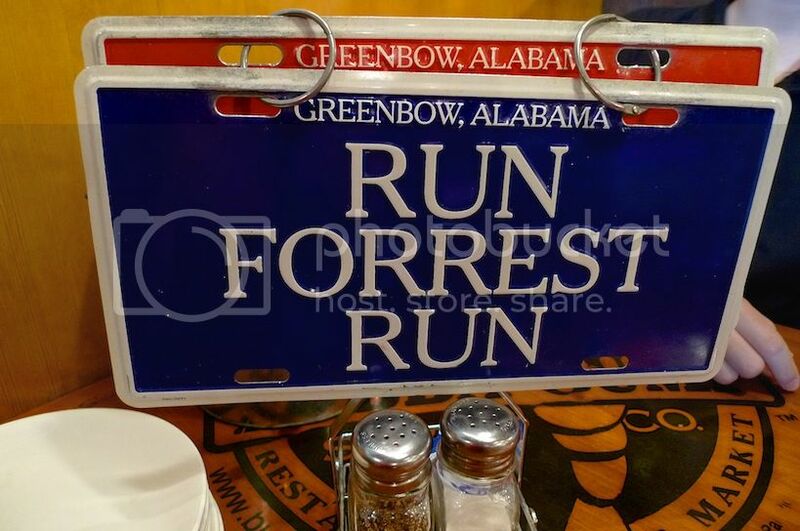 Bubba Gump Shrimp Co. is based on the famous 1994 movie Forrest Gump starring Tom Hanks. If you have not watched this movie before, you should go watch it! For those of you who have watched this excellent movie, you will know the story behind "Run Forrest Run" and "Stop Forrest Stop". If you don't, please Google it or go watch the movie. LOL! In this restaurant, they have a unique way to serve you. There are two license plate signs on the table. 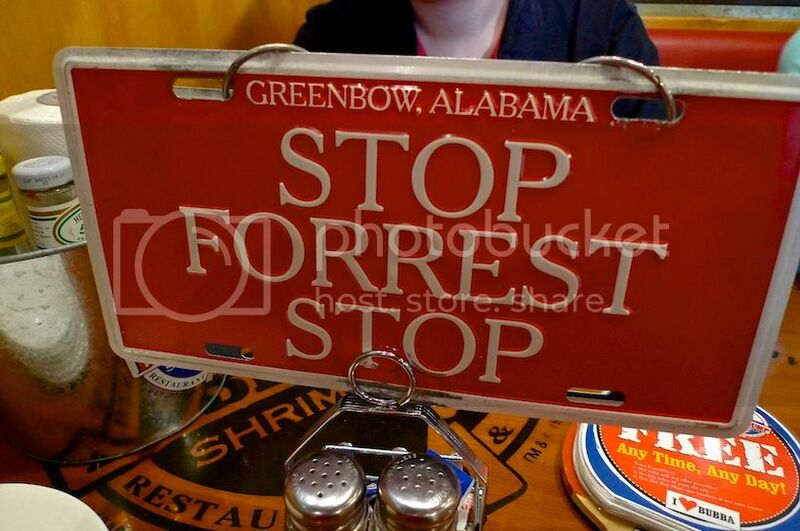 The red "Stop Forrest Stop" is used to signal the waiter that your table needs service, and the blue "Run Forrest Run" is to say everything is fine, or do not disturb! Personally, I find turning the plates a bit of a hassle. I rather just call or wave to the waiter. Besides, I left the red plate there to signal for service but no one came for quite a long time! I thought it sort of defeats the purpose unless they are always watching your table. 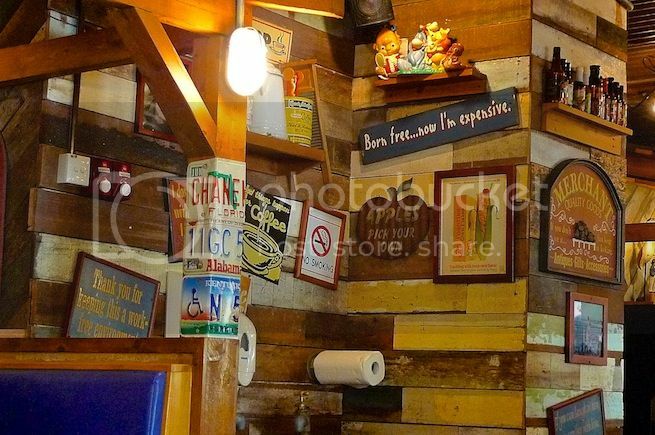 There were many interesting stuffs to look at inside the restaurant. 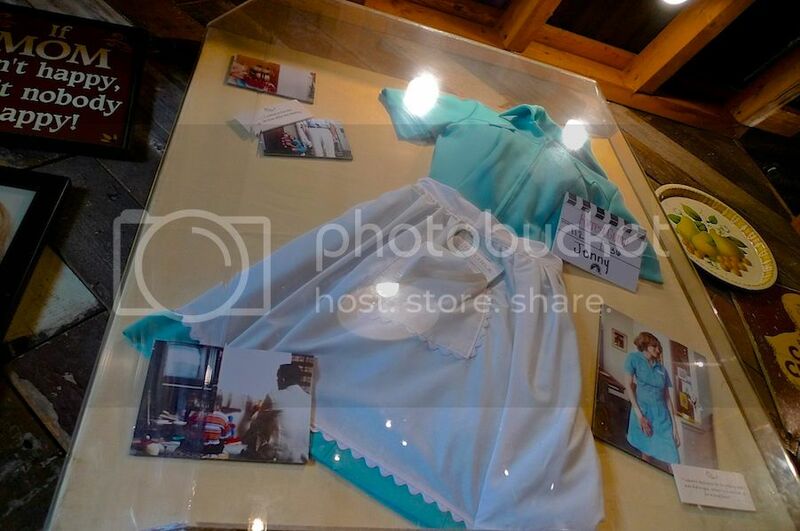 Mainly stuffs related to the movie. 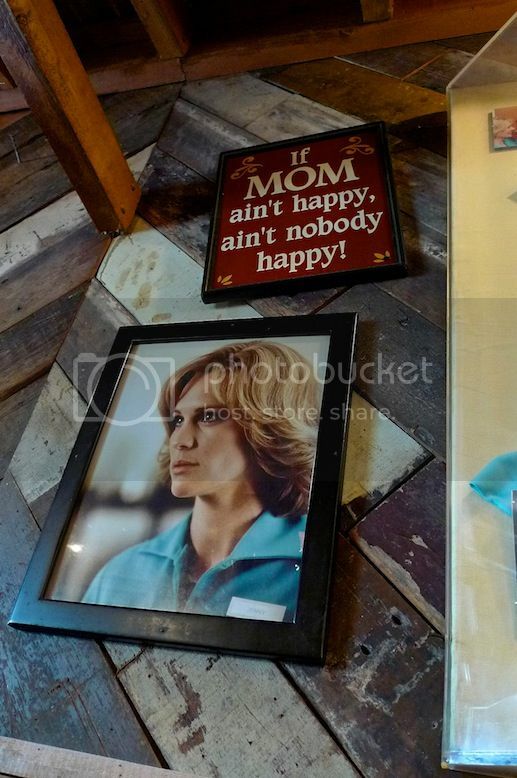 "If Mom ain't happy, ain't nobody happy!" - one of the quotes from Forrest Gump. 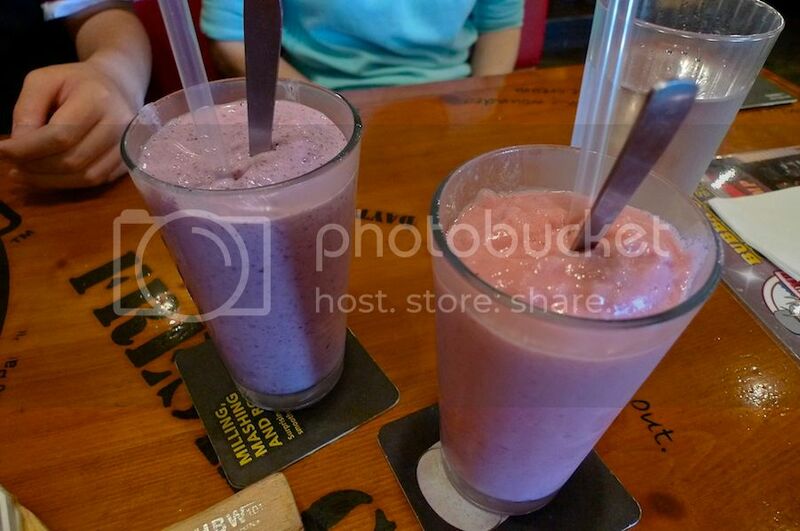 I ordered the Blueberry Smoothie and my nephew ordered Jenny's Favorite - a mixture of cranberry, strawberry and raspberry smoothie. Jenny, by the way is Forrest Gump's girlfriend in the movie. My sister just ordered a glass of water as she was planning to go Starbucks for coffee later. We were not really hungry but we ordered Shrimp Heaven, Scampi and Fish and Chips. All of us shared the Shrimp Heaven. 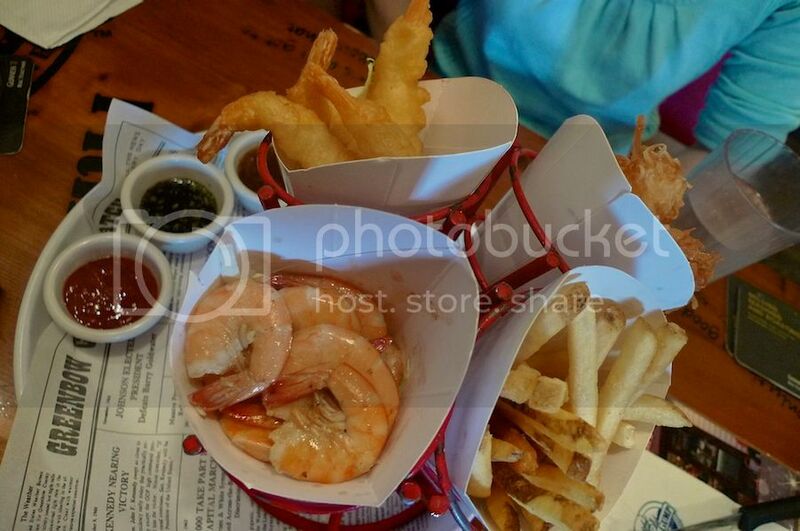 I thought the fried shrimps and fries in the Shrimp Heaven set were just OK, maybe they should add more sauces for dipping. My sister and nephew shared the Fish and Chips. Forgot to take a picture of the Fish and Chips - they looked pretty normal. My sister said it was not bad. I chose the Scampi - basically shrimp with pasta. It was delicious!! The bill came to about RM150. Rather expensive, don't you think? Well, I guess the pricing is quite similar with Western restaurants like Chili's, TGI Friday's, and Tony Roma's. 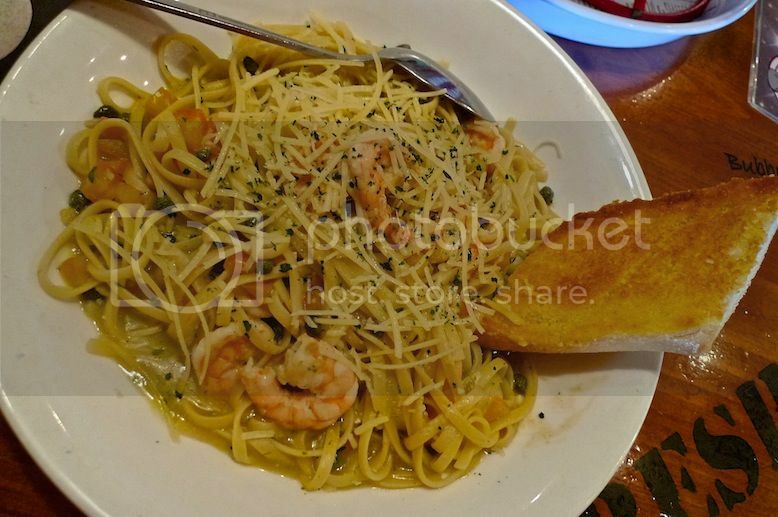 I do not mind ordering the Scampi again on my next visit, but it probably won't be anytime soon. 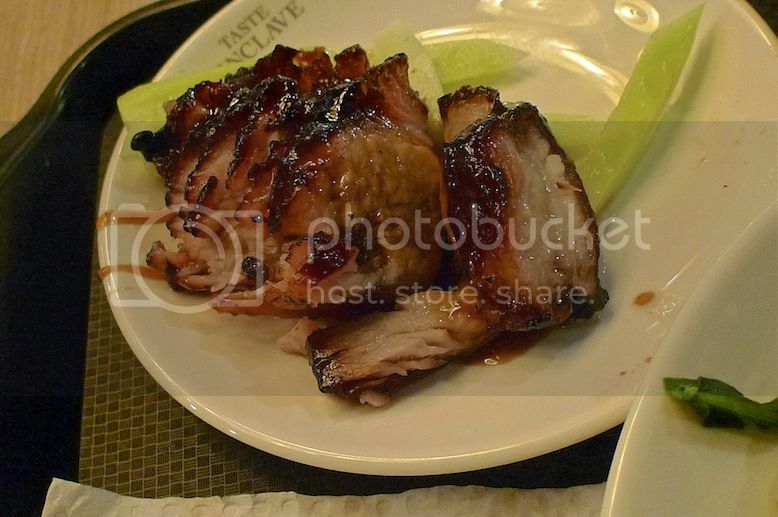 About 2 weeks before Chinese New Year, I visited Taste Enclave at Avenue K in Jalan Ampang, KL. 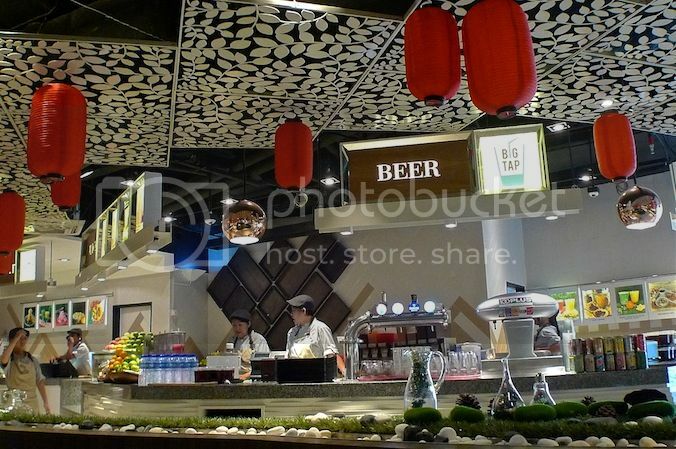 I have heard so much about this new food court and was eager to try out the food there! It was a Sunday afternoon and there were some people dining there, although not a lot. 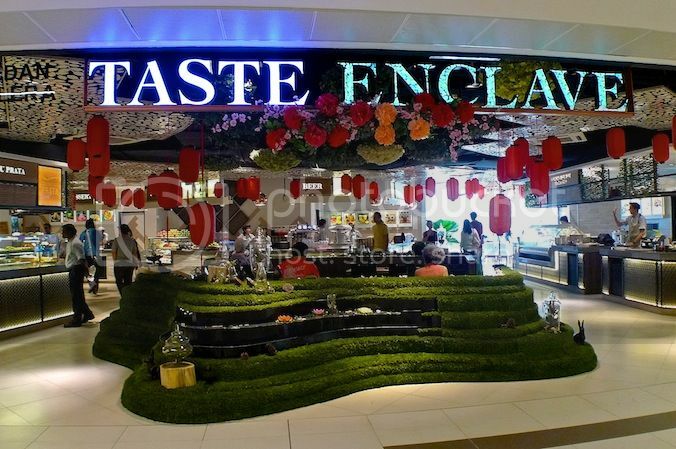 I heard that Taste Enclave was opened by a Singaporean who had set up many chains of food court and fine dining restaurants in Singapore and China. 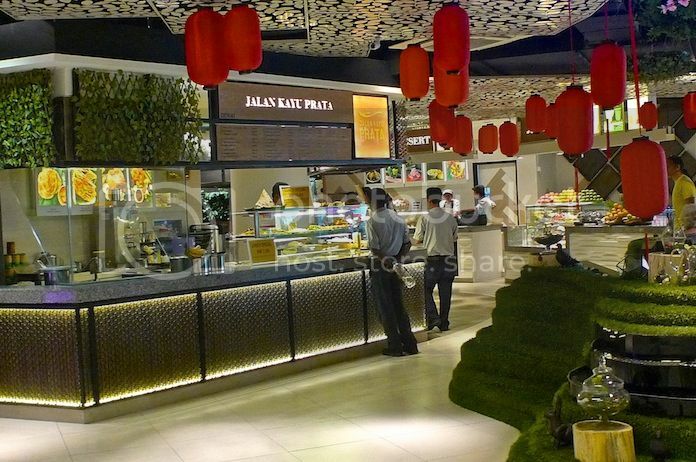 Indeed, this food court offers a variety of dishes that represent street food from Singapore and the Klang Valley in Malaysia. Since I was alone, I had to be selective with the choice of food as my stomach could only take in so much. 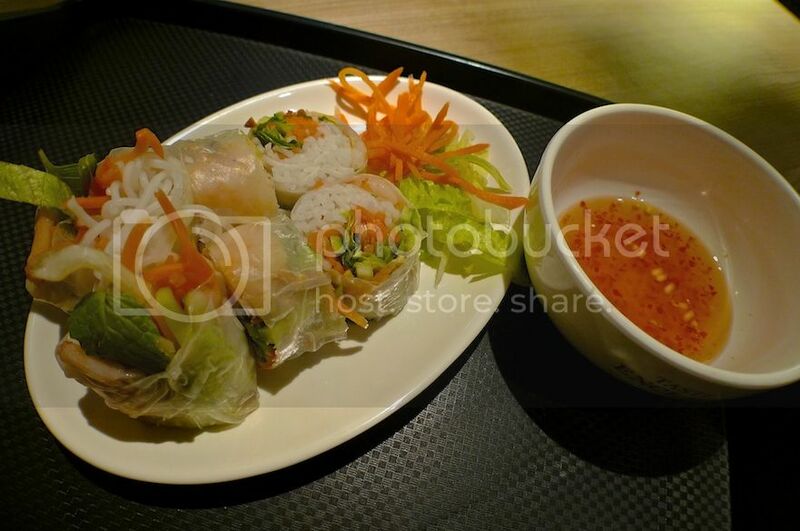 I started with the Vietnamese Spring Roll from Y-Thu Wendy Authentic Vietnamese stall. The spring rolls were delicious especially when dipped into the spicy sour sauce. 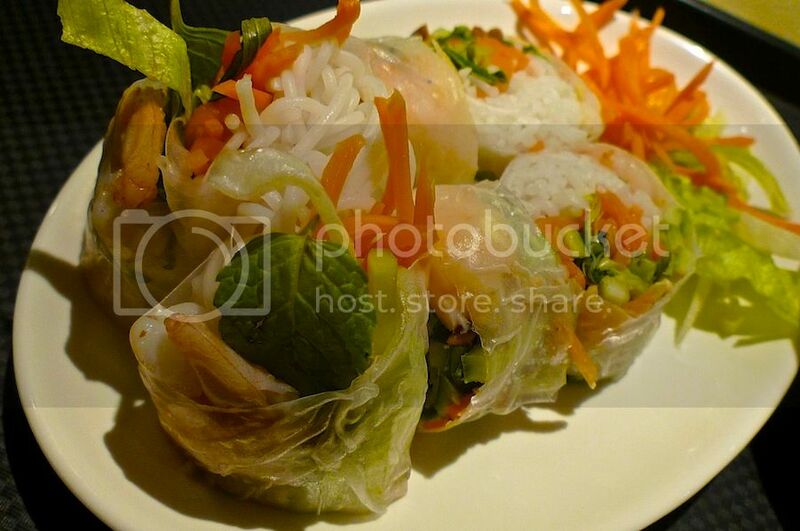 It was good, but not as good as the Vietnamese Spring Roll I had at Koto Restaurant in Hanoi. Still, I was pretty satisfied. 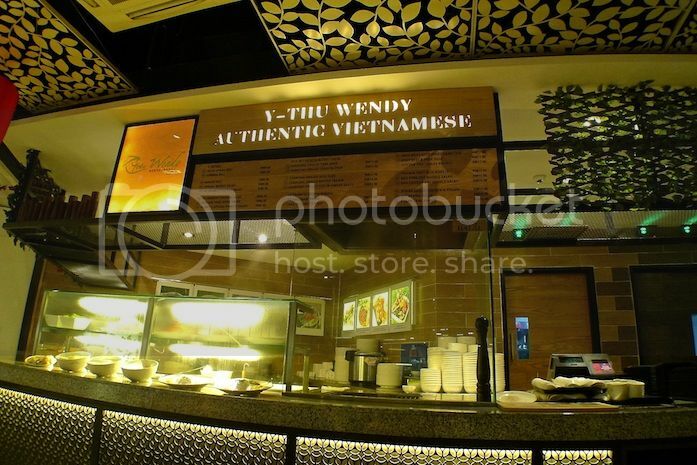 Hailing from Vietnam, Wendy has already established 5 outlets in food courts across Singapore. 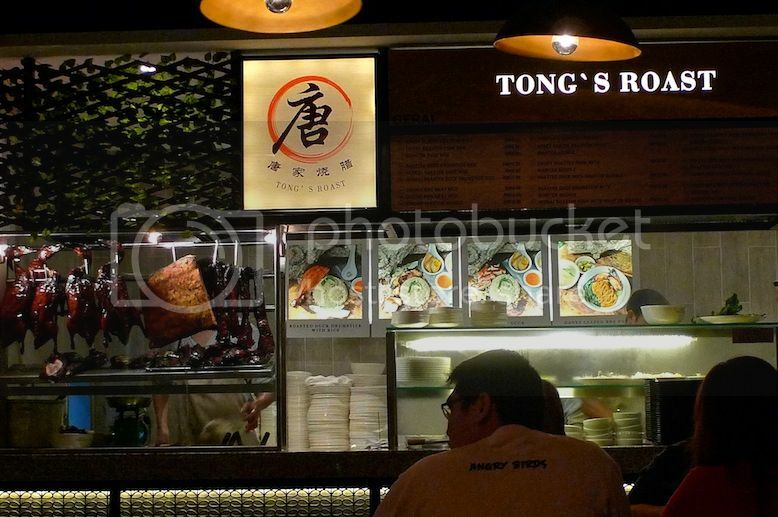 Next, I went for the famous Crispy Roasted Pork With Wanton Noodles from Tong's Roast. 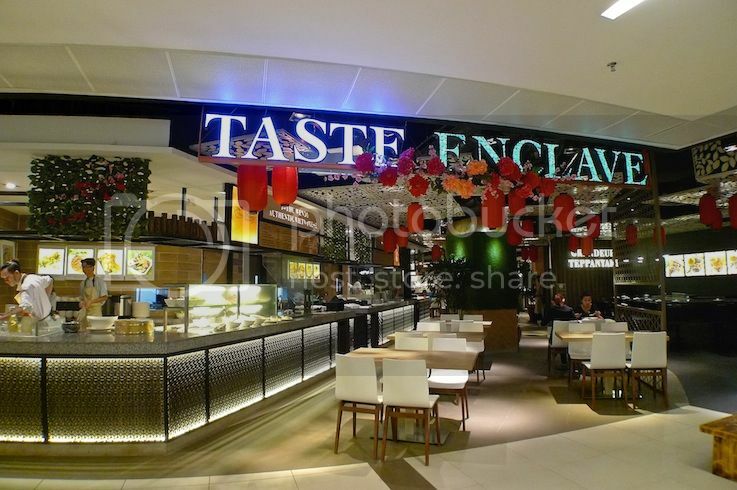 Oh yes, I forgot to mention Taste Enclave is a non-halal food court. The roasted pork was delicious! And the wanton noodles were pretty satisfying too! Tong's Roast is a family business that spanned more than 30 years starting as a roast meat wholesaler at Pudu Market in KL. I guess this must be their first stall in a food court inside a shopping mall. I was already quite full by then, but I had to try one more. 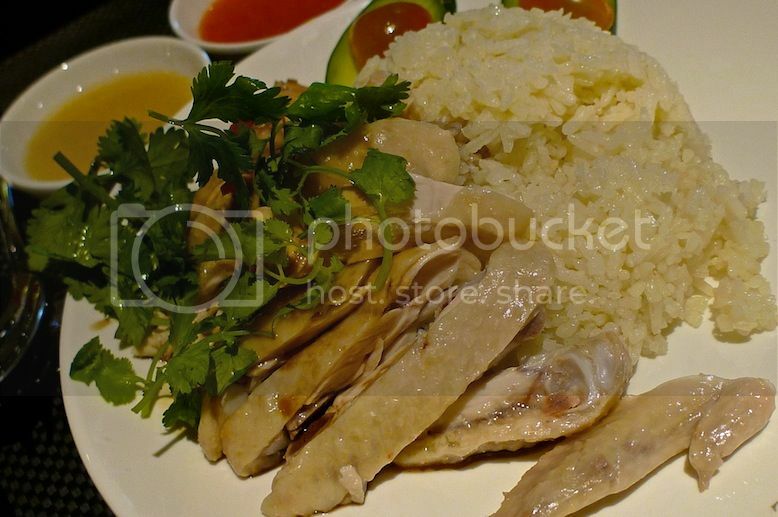 I decided to go for steamed chicken rice at Singapore's Mandarin Chicken Rice stall. I was not impressed by this chicken rice. It was not bad, but it was not good either. I have eaten better chicken rice elsewhere. However, my enjoyment of the food there was marred when upon taking a photo of their stall after finishing my chicken rice, they appeared to be alarmed. Then, someone (probably the person in charge of the food court) came up to me and said "Photography is not allowed". What the …..?!! I was really quite annoyed, but I remained calm and said OK, and walked out of the food court. Now can anyone please tell me why photography is not allowed there? What's wrong with taking photos of the food and the stalls? Don't they know I am giving them free publicity when I share those photos? What nonsense! Besides, they organized a blogger event last year and all those bloggers were snapping away and putting up pictures on their blogs. So what's wrong with me taking a few photos now? Utter rubbish! Anyway, I sat outside and waited it out before going right back into the food court and snapped a few more photos. Sue me! Next time you want to stop me or anyone taking photos, please put up a HUGE sign at the entrance with the words in red "NO PHOTOGRAPHY ALLOWED". Then at least, I know it's not just verbal and that you mean it. And of course, I can then decide whether I want to enter or not! Here are a few more photos of the stalls at Taste Enclave. 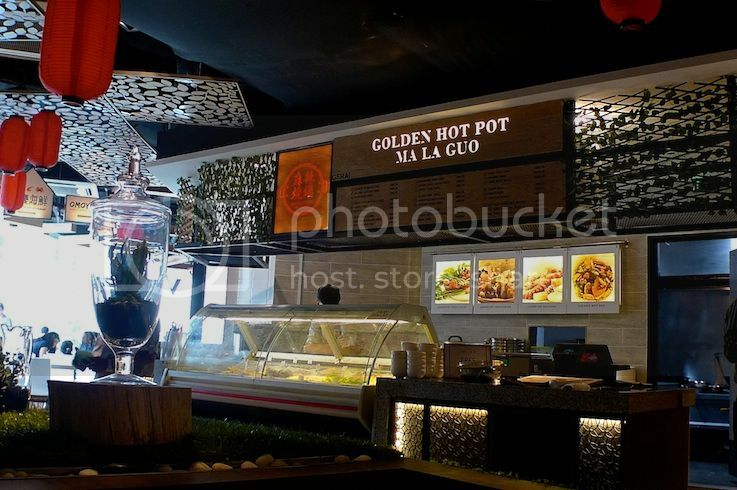 Golden Hot Pot from China. Not sure what they sell though. Did not check them out. There's a stall called Big Tap serving beer too! 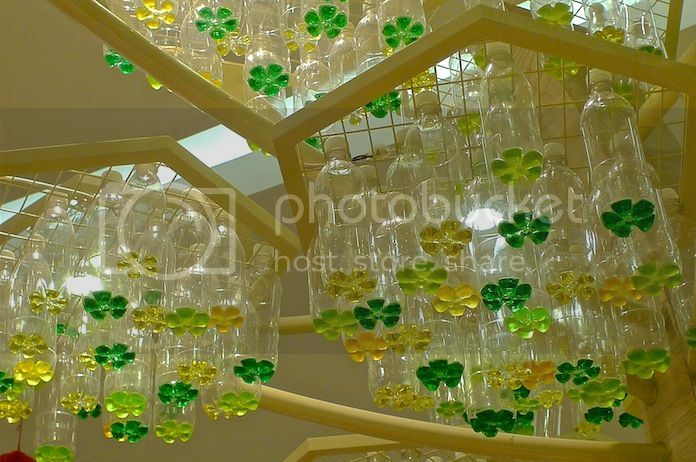 Choose from Guinness, Kilkenny and Heineken! I had wanted to try this famous Jalan Kayu Prata from Singapore after eating that chicken rice. I wanted to know how good Singapore's roti prata is compared to Malaysia's roti canai. But after I was told not to take photos, I decided to skip this. No more mood to eat. Too bad! 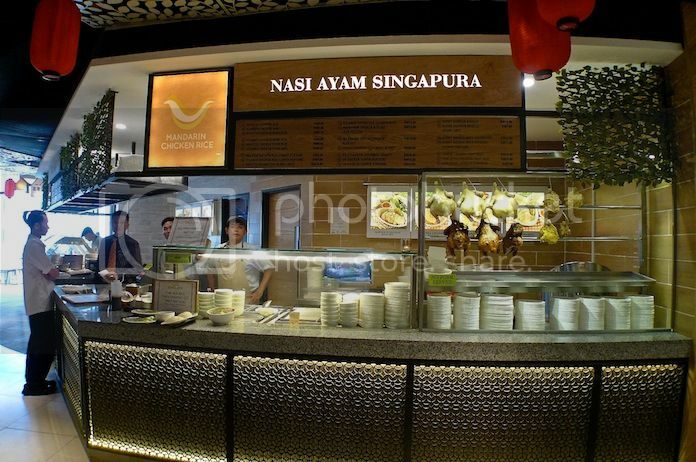 Oh well, I will just go Singapore next time and try the original one there! Overall, I found Taste Enclave to be clean and comfortable. The prices were pretty reasonable too. I wish I could have tried more stalls there - so many more, like Soong Kee's beef noodles and Heun Kee's clay pot chicken rice to name just two - but I am doubtful I will ever step inside there again. No thanks to their silly 'No Photography' policy! How Can A Boeing 777 Plane Just Disappear? We have all heard about planes crashing. But a plane disappearing? That is an extremely rare occurrence! 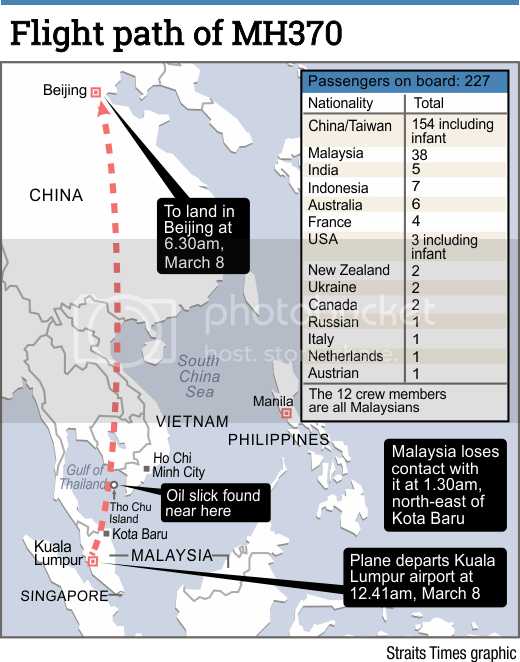 No one knows what happened to flight MH370 which was traveling from Kuala Lumpur to Beijing on the early morning of March 8th. The Malaysian Airlines (MAS) plane suddenly disappeared from the radar screen and lost all contacts with Kuala Lumpur International Airport (KLIA) at 1.30am, which was about 45 minutes into its flight. Somewhere over the South China Sea, off the coast of Vietnam, the Boeing 777 jetliner carrying 227 passengers and 12 crew members just vanished. There was no distress call, no indication of any danger or malfunction of any kind. Nothing. Search parties from Malaysia, Vietnam, China, and a number of other countries had been trying to locate it for the past 48 hours without success. This incident must be one of the most puzzling mysteries of the year! Why puzzling? 1. The Boeing 777 is one of the safest planes in the world today. Except for a botched landing that killed 3 people in San Francisco in 2013, there have never been any crash fatalities. And MAS has one of the best safety records of all airlines in Asia. 2. The most dangerous part of a flight is during the take off and landing. But this incident happened during the safest phase of the flight that is, while it was cruising! 3. The plane did not run into any violent storm. The weather was perfectly fine! 4. There was no distress calls from the pilot. Given that the plane was cruising at that time, the pilot would have plenty of time to report any mechanical malfunction or problems. Even in the unlikely scenario where both of the plane's engines shut down, the plane could still glide for about 20 minutes, giving the pilot lots of time to radio for help. 5. The plane's inbuilt tracker (known as flight transponder) should automatically update its location to Air Traffic Control but in this case, it did not! The transponder data mysteriously showed no change in altitude or course. 6. A sudden bomb explosion due to terrorist activity would explain why there was no distress call and no update on the transponder device. An explosion at such an altitude would cause the plane debris to spread out over a wide area but so far, no debris has been found. 7. Even if it's due to terrorism, why up to now, no one is claiming responsibility? 8. The plane could possibly being hijacked, but then again, why would anyone want to hijack a plane and dive it into the sea? Wouldn't the hijackers land it at the airport so that they could voice their demands? 9. There were reports that the plane did an unusual turn back moments before it disappeared from the radar screen but why would the pilot not made a distress call in such a case? So many questions and no definite answer. For now, there are only theories and speculation. You can read up on more of the theories on what happened to MH370 flight HERE. Meantime, I pray that the search parties from all the different countries will be able to locate the missing plane soon. If no survivors are found, this will rank as the deadliest airline disaster since November 12, 2001. I'm Giving Up On Snowflake! I used to like Snowflake. Loved it lots. It was, in my opinion, one of the better dessert shops around. And then something went wrong. The quality started to deteriorate. 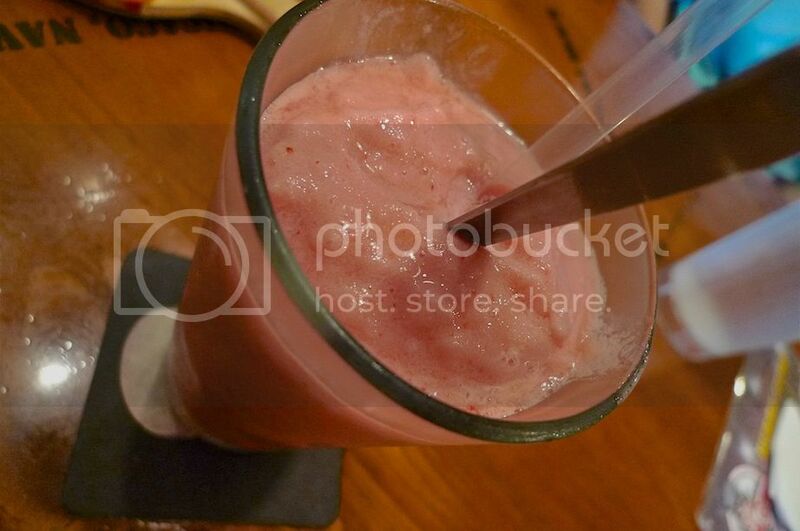 The shaved ice had became coarse and was not as fine as before. It was no longer my favorite dessert. 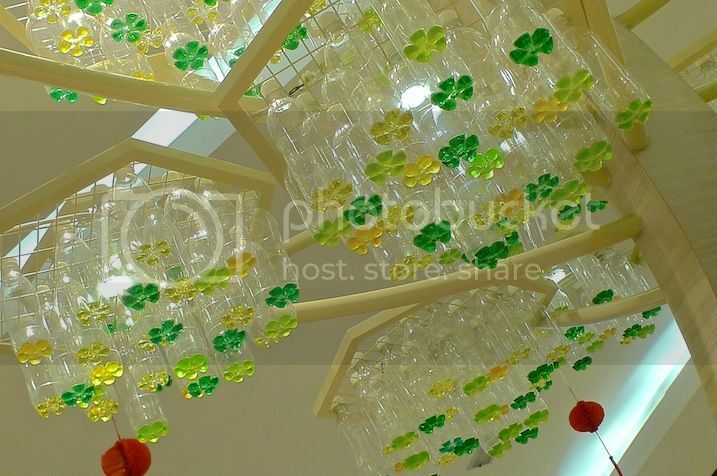 A week before Chinese New Year, I was shopping at Paradigm Mall when I chanced upon Snowflake again. At that time, they were heavily promoting their new Mango series so I decided to give it one more chance. 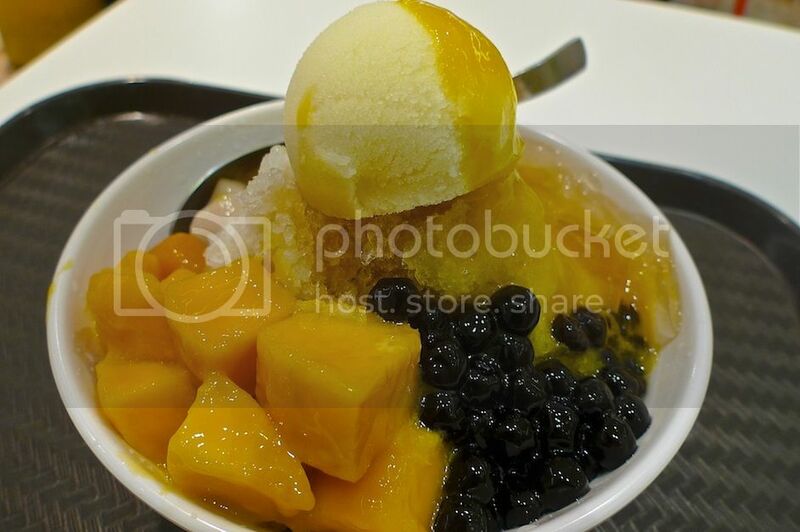 I ordered the Mango Sensation, priced at RM12.90. Unfortunately, it did not taste good to me. And the shaved ice - look at the shaved ice!! So coarse and rough! It's a far cry from the Snowflake that I used to know when it first started. At that time, I was full of praise for its finely shaved ice. 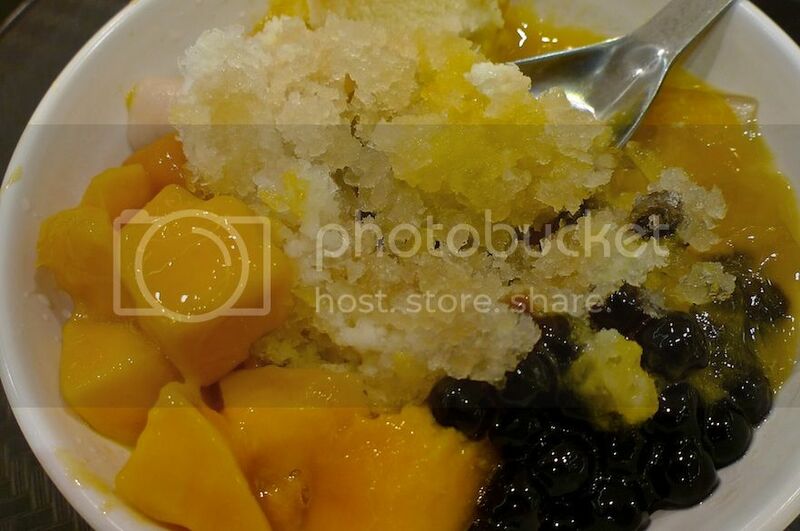 Now, it's worse than eating poor quality ice kacang! I regret to say this, but I'm giving up on Snowflake. Unless they do something and improve. Maybe, then just maybe, I will go back. 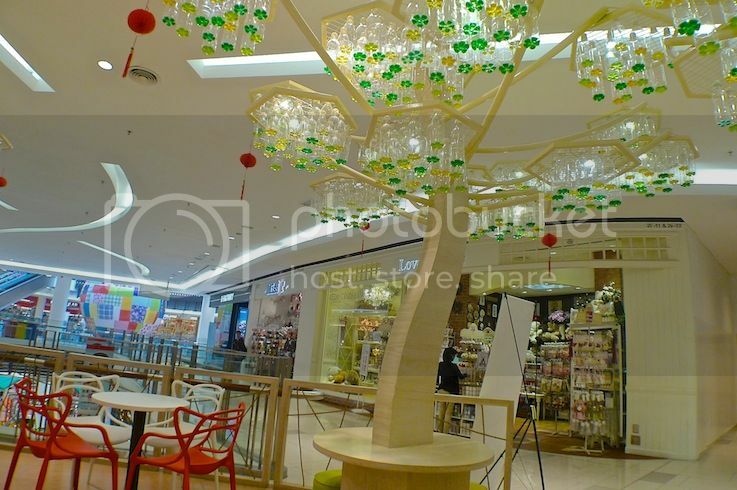 On another matter, I noticed that the Snowflake shop at Paradigm Mall had a rather interesting design in the form of trees made from recycled plastic bottles! Ooh! I just love this tree! 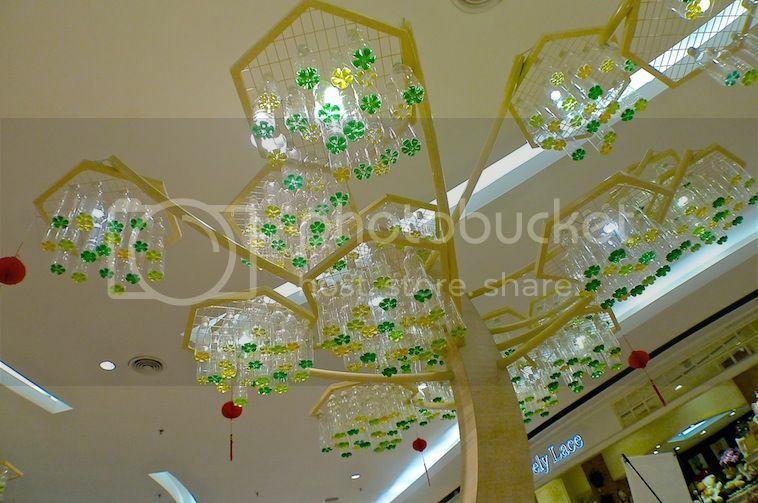 So creative of them using simple plastic bottles to create a tree! Although I am very disappointed with their Mango Sensation, I am giving them full marks for this beautiful design! But good creative design is not going to make your customers come back for more, it's still the food that matters. So buck up, Snowflake. And make me want to eat your desserts again! Otherwise, I will just have to say good bye for good! Is Bangkok Still A Safe Destination? 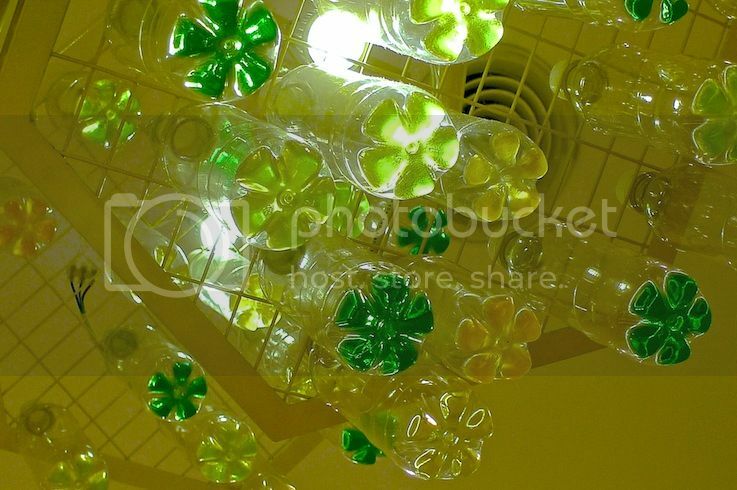 I had just returned from my short holidays in Bangkok. Going to Bangkok is almost turning into a yearly affair for me. In fact, this would be my sixth time visiting the City Of Angels. What is so attractive about Bangkok that I keep returning to it time and again? Honestly, I do not know. Most likely the reason has got to do with its food and its people. Also, holidaying in Bangkok is pretty cheap and what I really like is that it takes a mere 2 hours flight from Kuala Lumpur to get there. However, this time, a lot of people had advised me not to visit Bangkok due to the political crisis currently happening in this city. 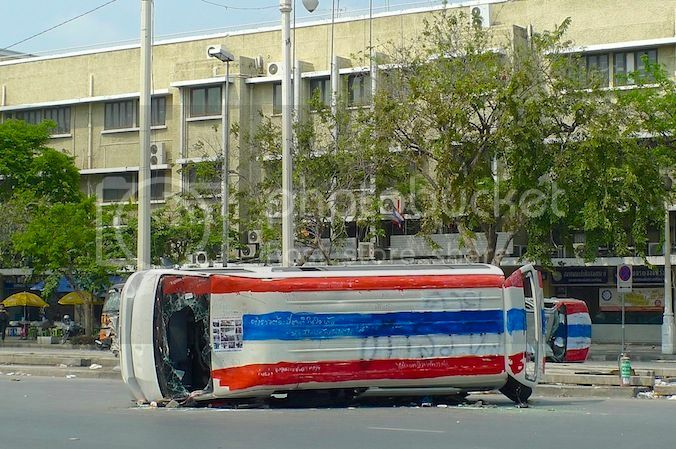 News about anti-Government protests, bombings and violence in Bangkok certainly did not help. But I had already paid for my flight and hotel months ahead so foregoing this trip would be the last thing on my mind. > Don't know what's happening in Bangkok? Read HERE. Luckily with the help of some Thai friends on Facebook and updates on Twitter from foreigners staying in Bangkok, I was assured that the situation in Bangkok was generally still pretty safe. Anyway, my Bangkok trip turned out to be relatively peaceful, relaxing and highly enjoyable. I will blog more about what I did in Bangkok in future posts, but for now, let me just share with you some photos I took to highlight the current situation there. 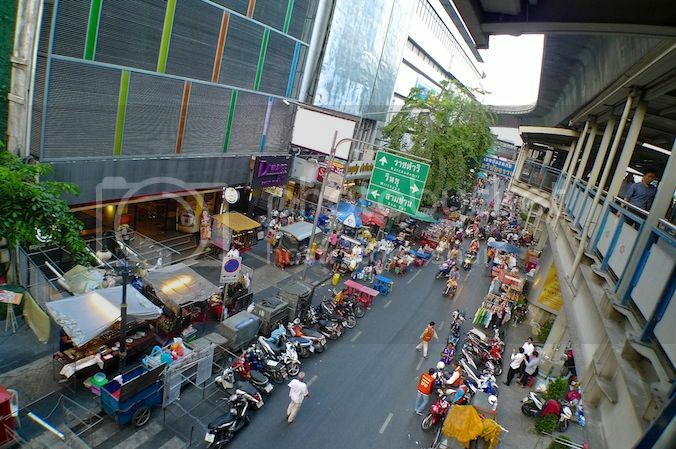 This is Silom road. I was on the Skyway bridge near the Saladaeng BTS station. 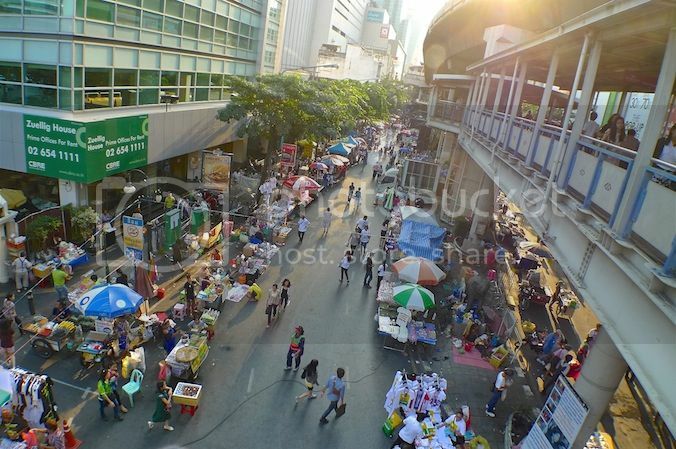 There were many stalls cashing in on the political rally happening close to the Silom MRT station. I must say the large number of stalls selling food, clothes and other things lent an atmosphere of festivity here. I did not feel afraid or fearful at all. Of course, traffic was chaotic and mostly jammed up. Never travel by taxi unless absolutely necessary. 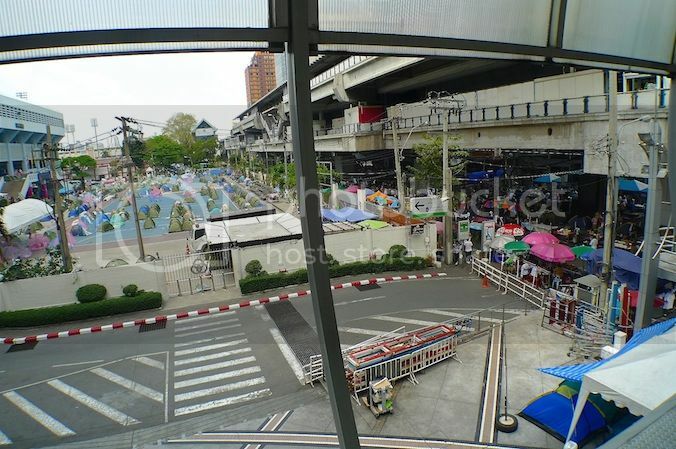 Make full use of the BTS (skyway) and MRT (subway) trains and you would have no problem getting around Bangkok with ease, at least to most of the shopping malls. This is a rally near to the Silom MRT Station. 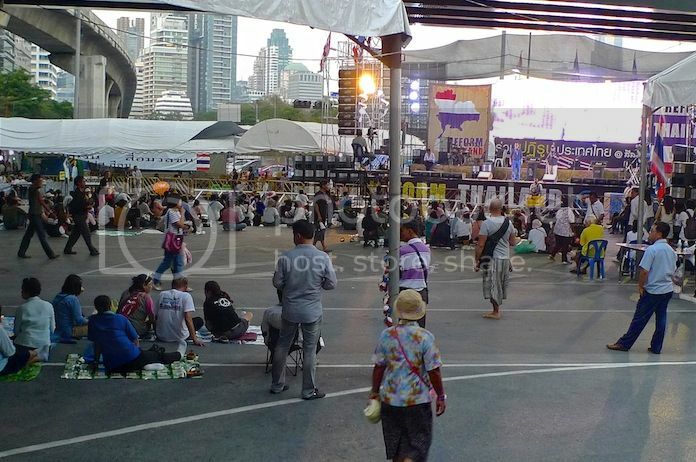 This live rally is beamed to anti-Government protesters gathering at other locations around Bangkok via huge screens. People were sitting or standing listening to the person speaking on stage. Occasionally, they burst out in applause. I took a photo of this scene just outside the National Stadium BTS Station near MBK Shopping Mall. This is another anti-Government protest hot spot in Bangkok. It was my first time seeing so many tents lying on the open space. Looked like the protestors must be camping out here! I heard that they have been blocking major intersections in Bangkok since beginning of the year as part of their 'Bangkok Shutdown' campaign. Certain roads were blocked with barbed wires like this one on Astadang Road near to Wat Ratchabophit - a beautiful, charming temple which I visited. Probably one of the most violent clashes between police and anti-Government protestors happened along Ratchadamnoen Klang Road near Democracy Monument. I was glad it did not happen while I was there. I had no intention of visiting the Democracy Monument but I was there to visit the Rattanakosin Exhibition Hall, which was a fairly new tourist attraction in Bangkok. Unfortunately, no one told me that it was closed!! 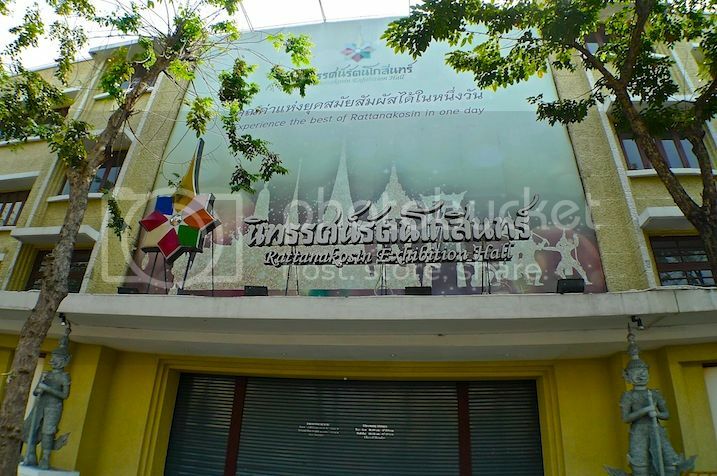 No one - not my hotel, not the cab driver nor my Thai friends - knew it was closed on that day. And if it was mentioned on its website or Facebook page, I sure did not see it! 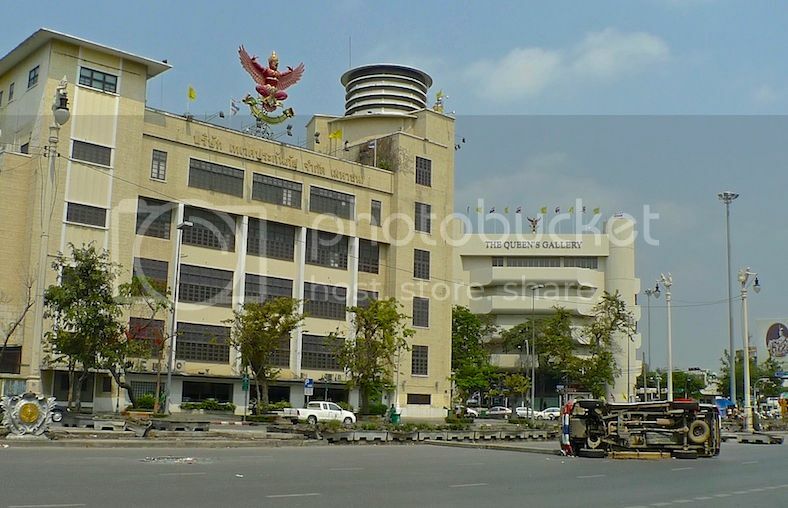 It was probably closed indefinitely due to the violent clashes that happened in the area. What I saw on the road in front of the Rattanakosin Exhibition Hall was a little shocking at first. 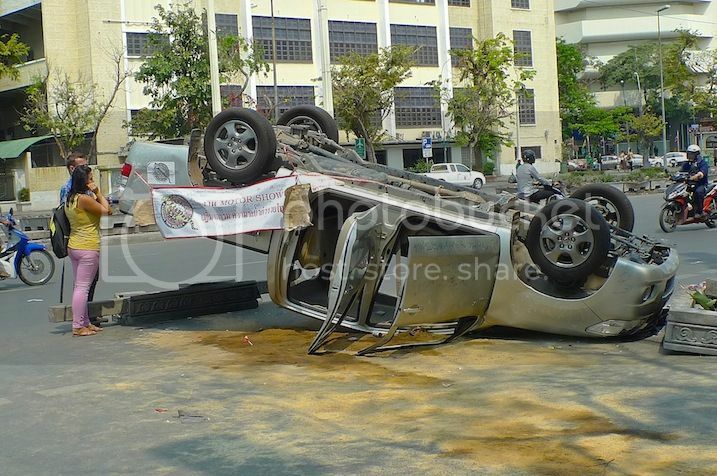 There were many damaged and overturned vehicles lying around. 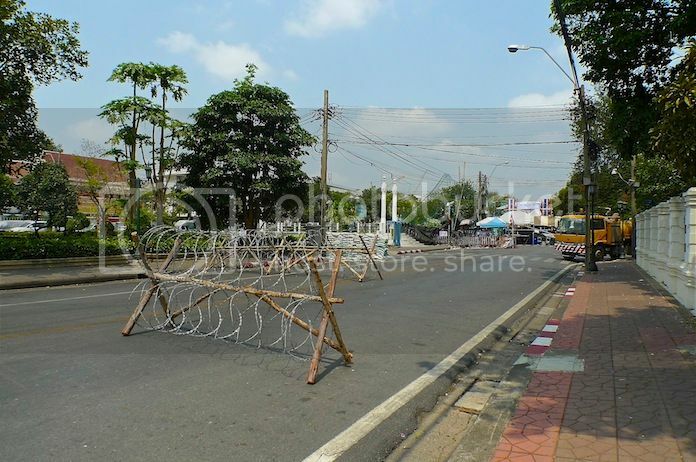 Barricades were set up and policemen were all over the place. Surprisingly, I did not feel any danger at all. Even the policemen were friendly and I managed to speak to one of them despite the language barrier. Amusingly, many tourists used this opportunity to take photos and selfies of themselves posing in front of those damaged cars! I must really give it to the Thais for creatively turning this 'war zone' into another form of tourist attraction. 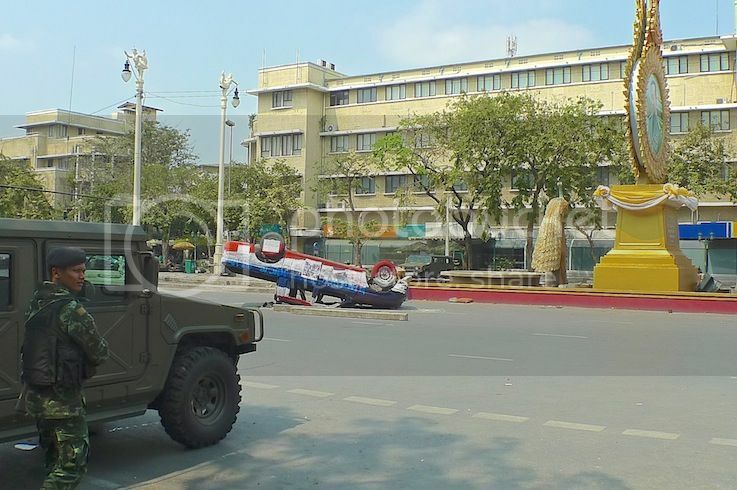 So, if you want to have your photos taken with these overturned vehicles, quickly fly over to Bangkok now and get it done before they are towed away! LOL! 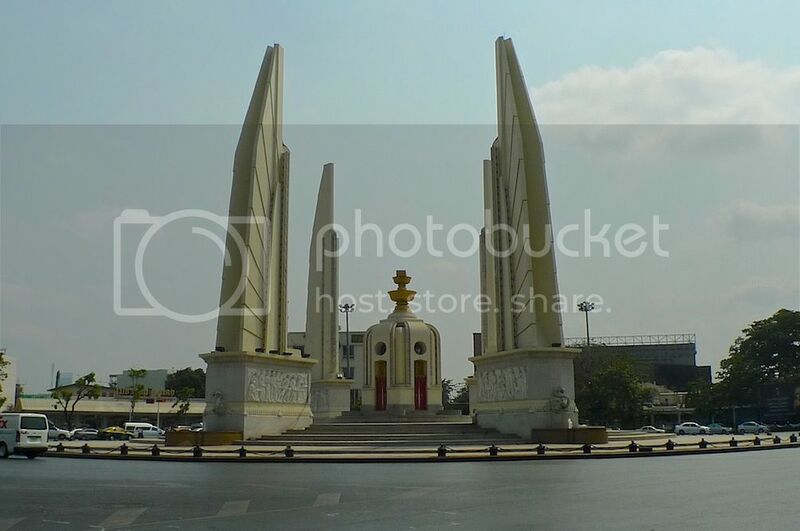 I thought with Rattanakosin closed, I could perhaps go visit Wat Saket nearby. 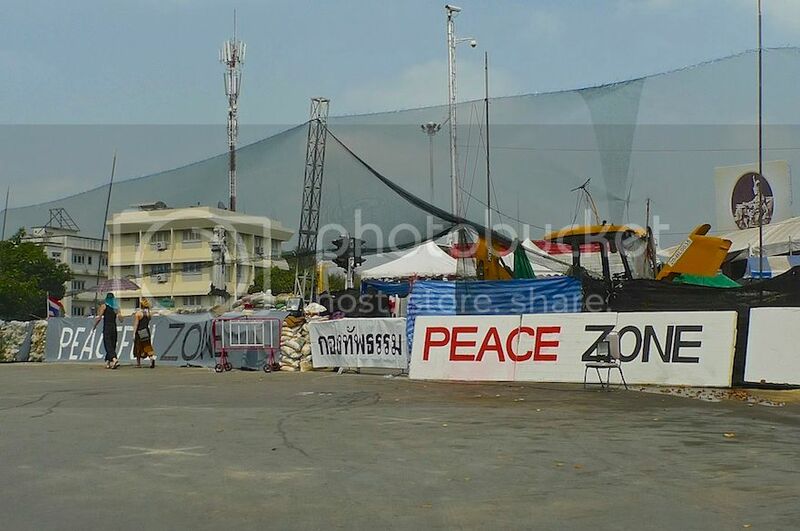 But I soon discovered that the road to Wat Saket was blocked with 'Peace Zone' banners put up. An overturned car that attracted a couple of curious tourists. So is it still safe to go Bangkok? Well, I went there and survived it. 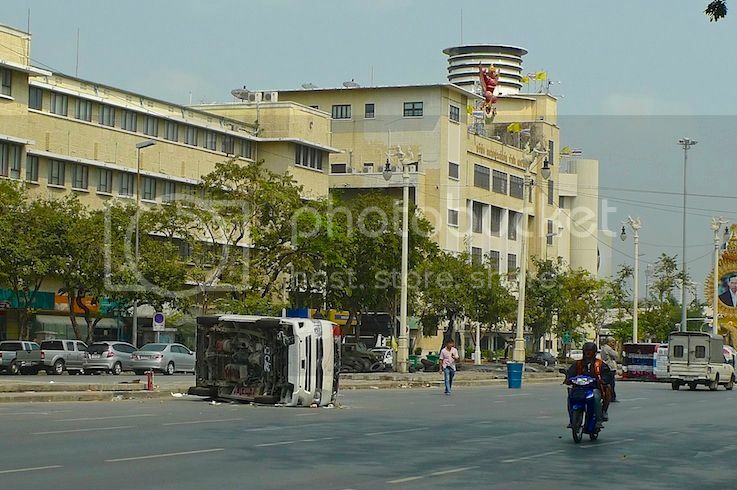 So far, no foreign tourists have been known to be injured in the political clashes. In fact, with the less number of tourists (many tourists had avoided Bangkok and went to other parts of Thailand), hotel rates are cheaper and it's also less crowded - which is exactly what I love! The only downside is that security is tighter than usual, not that this is bad, but it might be a bit of a hassle to have your bags and backpacks checked every time you enter a shopping mall or a MRT station. 1. Try to avoid the protest sites, although they are mostly peaceful. Since the sites can change from time to time, keep yourself updated with the latest news on Twitter and Facebook. Follow Twitter feeds with hashtags #Thailand and #BKKShutdown. 2. If you cannot avoid a protest site, try not to linger too long there. The situation may seem peaceful, but you never know that it might unexpectedly turn rowdy or violent. 3. If like me, you want to take pictures of the protest sites, do so in the day time. More people congregate for the evening speeches so the chances of things turning bad will most likely happen during the evenings or nights. 4. 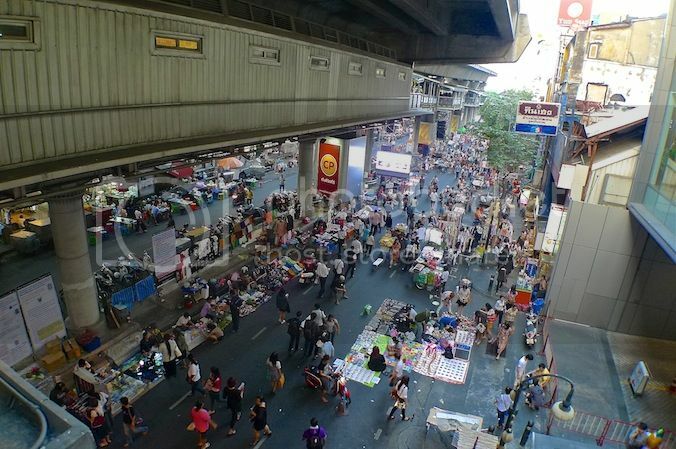 Most major shopping malls near to protest sites like MBK, Siam Paragon and Terminal 21 can be easily and safely accessed via elevated walkways after exiting the BTS stations without having to walk through the areas where the protestors gather. 5. Protest sites and surrounding areas should be completely avoided after dark. In fact, do not stay out too late. 6. Do not voice any opinions about the anti-Government protests to any local Thai people that you are not familiar with as you cannot be sure which side they are on. Emotions do run high and it's better to stay neutral. 7. Do not wear any solid red color shirts (which signifies pro-Government) or shirts that say 'Popcorn Army' (which supports anti-Government) to avoid being targeted. 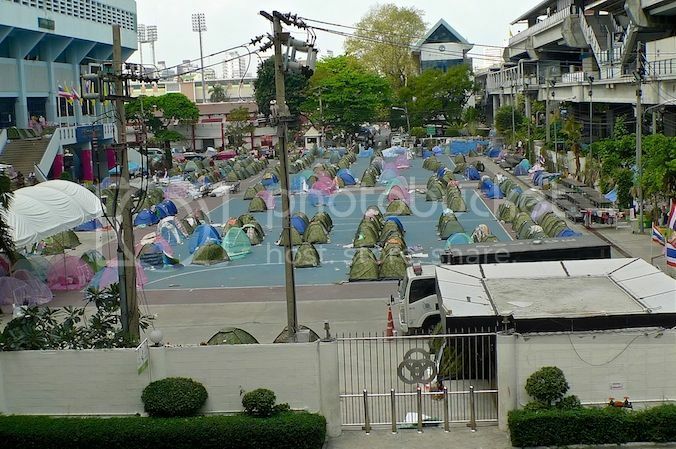 *Latest News : Anti-Government protestors have ended their occupation of all intersections and moved to Lumpini Park since Monday, March 3rd. This should free up the traffic congestion in Bangkok and perhaps make it safer for tourists.